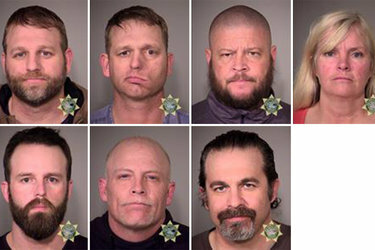 The FBI and Oregon State Police announced last night the arrests of six of the antigovernment extremists occupying the Malheur National Wildlife Refuge near Bend, Ore. including leader Ammon Bundy. One militant, Robert 'LaVoy' Finicum, the "militia spokesman," was shot and killed in a confrontation with authorities. At approximately 6:30 p.m. (PST), the FBI arrested Peter Santilli, age 50, of Cincinnati, Ohio, in Burns, Oregon. He faces the same federal felony charge as the individuals listed below. The arrest was without incident. At approximately 4:25 p.m. (PST) on Tuesday, January 26, 2016, the Federal Bureau of Investigation (FBI) and Oregon State Police (OSP) began an enforcement action to bring into custody a number of individuals associated with the armed occupation of the Malheur National Wildlife Refuge. During that arrest, there were shots fired. One individual who was a subject of a federal probable cause arrest is deceased. We will not be releasing any information about that person pending identification by the medical examiner's office. One individual suffered non-life threatening injuries and was transported to a local hospital for treatment. He was arrested and is currently in custody. Booking photographs of Ammon Bundy, Ryan Bundy, Brian Cavalier, Shawna Cox, Ryan Waylen Payne, Joseph Donald O’Shaughnessy and Peter Santilli. These probable cause arrests occurred along Highway 235. We continue to work with Harney County Sheriff Dave Ward and his deputies; Oregon State Police; and the United States Attorney's Office to address any further outstanding issues. As the investigation is ongoing, we cannot comment further at this time. One dead, six arrested in traffic stop. Ammon Bundy, Ryan Bundy, Ryan Payne in custody. BREAKING: Law enforcement source: Leader of armed Oregon group that had occupied federal site arrested. Police say a statement will be released soon about developments involving law enforcement action and the refuge occupiers. Details scarce.